$10,000 QLD Government Digital Grant for Small Businesses! Are you a small business in Queensland looking to grow or build an online presence? Does your website need an update? Do you want to sell products online? Do you need to market your business? Social media feeling a bit overwhelming? Well, the Queensland government is willing to match dollar for dollar on a digital project up to $10,000! A simple $5,000 budget would become $10,000! Imagine how much more bang for your buck advertising you would receive! If you want new leads, customers and more money coming in the door, you MUST do some online marketing! Social Media marketing is incredibly cheap and effective! Let Key Communications guide you and your brand into becoming a social media powerhouse! What you need to know about the QLD Government Small Business Grant! If you have a small business, the QLD Government is offering an incredible almost unmissable opportunity to grow your business in the digital world. Is it finally time your business reached the wider online audience? Incredible website + Marketing Budget = Guaranteed growth and more customers! If you are eligible for this Grant you can receive matching funding up to the value of $10,000 (excluding GST) to boost your budget for digital marketing. Is my Business eligible for the grant? If you tick all of these requirements then….YES! What can I use this grant for? Building a Brand-New Website! We could update or create you a whole new website. Do you want an online shopping platform? Maybe you have some crazy ideas on how to make your business stand out. If not, we can help with that! A fresh website will entice new customers and allow your business to grow! Building a Google Ads campaign, google ads are one of the most effective ways to grow your business. Building a strong social media (Facebook/Instagram) presence and ad campaign to drive customers to your business! Applications are open for the Small Business Digital Grants Program until 5pm on the 8 October 2018. Remember, you could receive up to $10,000 in matched grant funding from the Qld Government to attract, convert & delight more customers, so you don’t want to miss out! How Key Communications can help? Key Comm would love to help you prepare a plan to grow your business to new levels! We are offering a one-hour consultation where we can discuss Digital Marketing oppertunities and ways to grow your business. 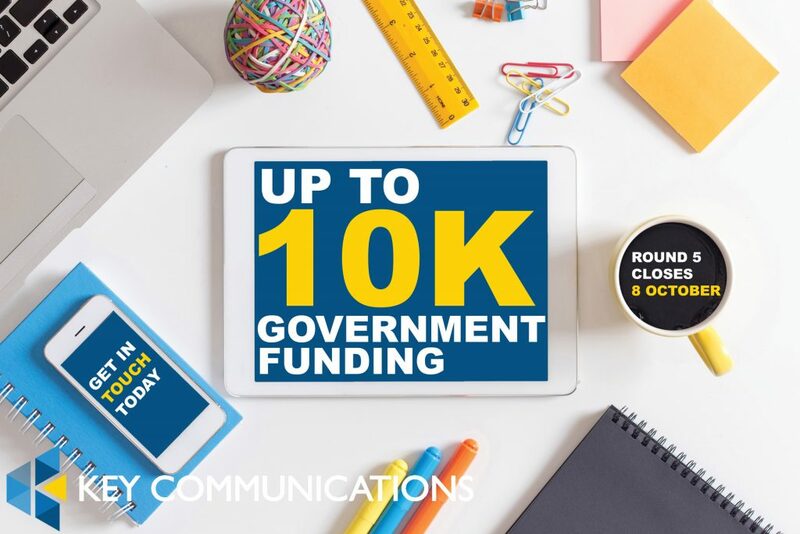 With a $10,000 grant available, there’s never been a better time to get in touch with Key Communications for a digital project! So if you would like a one-hour consultation, give us a call on 1300 755 615 and we’ll arrange a suitable time for a meeting!